So peach season is officially here and I am pumped! I love driving around on the country roads in the summer time and seeing all of the stands with fresh, ripe and juicy peaches. It always brings back fond memories when I think back to the day trips that we used to take as a family when I was a kid and we’d often stop by the little markets to pick up fresh peaches as a snack for the road. And THIS is the time to take advantage of those peaches when they’re super ripe and juicy…because I don’t know about you, but chomping down on a rock hard peach is just not my thing. While we’re going down memory lane, I should also mention that all throughout my university days, I had this obsession with putting peaches in my oatmeal. Call me crazy, but I always looked forward to those mornings where I could wake up and start my day with my peachy oatmeal. It’s just such a delicious combination of flavours! Now fast forward about ten years later and my mornings are not quite as leisurely with a busy baby demanding my attention. For a while there, I was starting to wonder if I would ever be able to make breakfast using two hands again, let alone eat my breakfast without him hanging out in my lap. Let’s just say, his hair got a few oatmeal treatments since I dropped it on his head a number of times. But I guess that’s just all part of mom life! One thing I’ve discovered throughout this whole motherhood thing, is it’s a heck of a lot easier just waking up to a ready-made breakfast because you really never know when you’re going to have a chance to make breakfast, or if you’ll even be lucky enough to sit down and eat it. That’s why I’m such a huge fan of overnight oats. And with peach season here, I got inspired to experiment with some Peach Pie Overnight Oats. 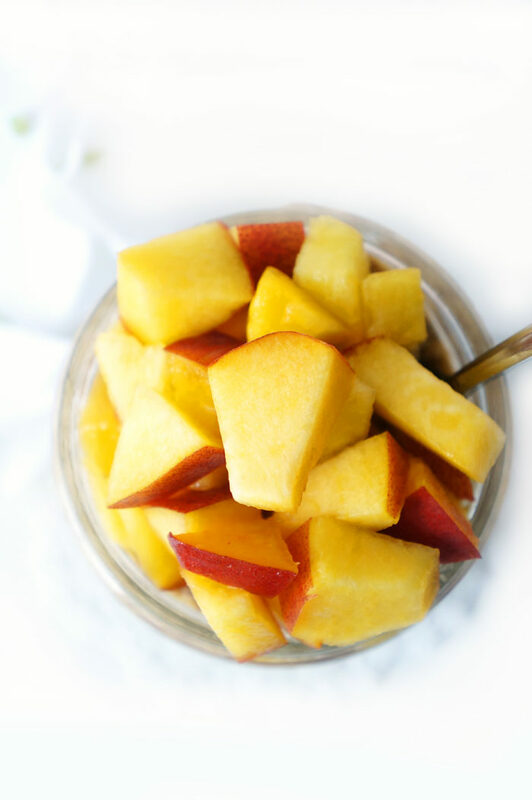 This recipe is unique, however, because rather than just dumping a bunch of chopped peaches into your oatmeal and calling it a day, I decided to incorporate that peachy flavour into EVERY SINGLE BITE. 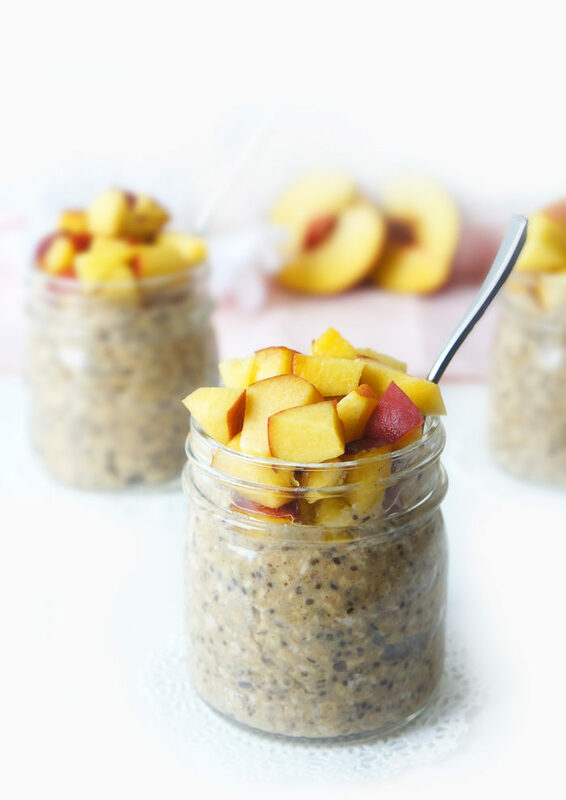 Blend the peaches up along with the almond milk, chia seeds, cinnamon, protein powder and/or maple syrup so that it’s nice and smooth. Basically like a peach smoothie. 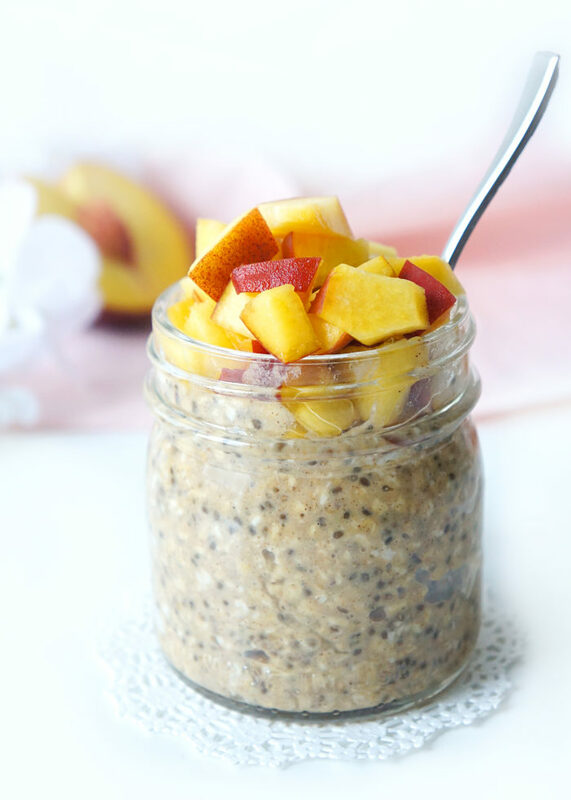 Pour this peach smoothie concoction over the dry oats, mix together and let it soak overnight or for at least several hours. You want it to be nice and thick so that you can eat it with a spoon. Top with additional chopped peaches. Add some extra cinnamon and chopped pecans or walnuts, if desired. 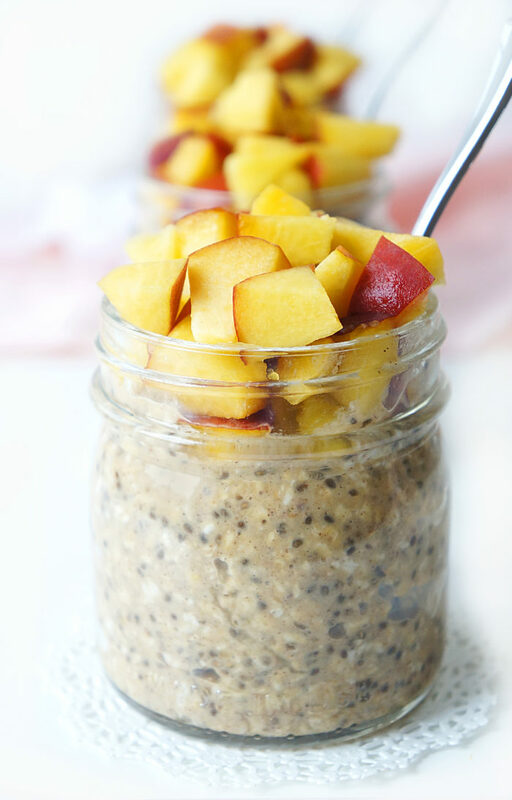 That’s what I call peach pie-infused overnight oats. I chose to add some vanilla-flavoured vegan protein powder (I like Sunwarrior Vanilla Protein Powder) and I found that not only increased the protein content, but also provided sufficient sweetness so that no additional sweetener was required. If you choose to forego the protein powder, then you might want to add a tablespoon of maple syrup to the mixture to add a bit of extra sweetness. If your peaches are extra ripe, then you might not require any additional sweetener at all. The peaches alone might be sufficient to sweeten up the oats. It’s totally up to you and your taste preferences! 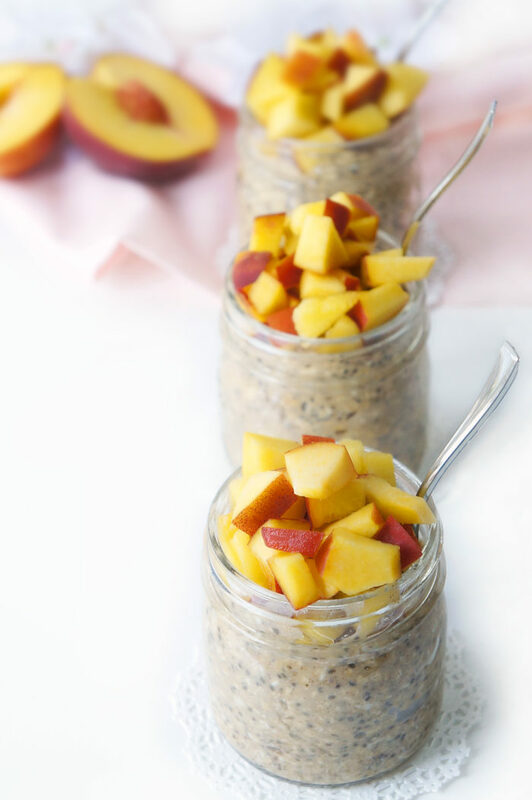 I recommend topping up these overnight oats with fresh chopped peaches, chopped nuts and a sprinkle of cinnamon for even more peach pie flavour!. If you’d like to make enough for the whole week, simply double or triple the recipe and allow the overnight oats to sit in the fridge. It should be good for up to 4-5 days. Overall, this recipe is full of fibre, protein, vitamin C and vitamin A, so you really can’t go wrong with this flavour, nutrient-packed, and easy make-ahead breakfast! Combine almond milk, peach, chia seeds, cinnamon, vanilla extract, protein powder and maple syrup (if using) in a blender and blend until smooth. Measure out a half a cup of oats into two bowls, jars or containers. Divide the peach smoothie mixture between the two servings of oats and stir until incorporated. Place in the fridge and allow to sit overnight or for at least four hours. Top each serving with remaining chopped peaches, walnuts or pecans and additional cinnamon, if desired. * If you don't add vanilla protein powder, you may need to add about 1 tbsp of maple syrup to the recipe to sweeten it up a bit. I found the protein powder made it sweet enough.